Did you know that you can get a patent on some of the weirdest things possible. Gene Simmons allegedly has one on dollar signs with two slashes through them and unbeknownst to us, guitarist Eddie Van Halen has one on coloured lines. At least that's what he purports in a new lawsuit against Nike shoes, reports KTLA-TV. Nike recently launched a brand of tennis shoe called the Dunk Lows that feature red, white and black stripes along the midsole. In his lawsuit, Van Halen claims that this in direct infringement of his trademark on such a design, as he received a copyright for it in 2001 based on his own (unofficial) trademark "Frankenstein" guitar with that very colour scheme. 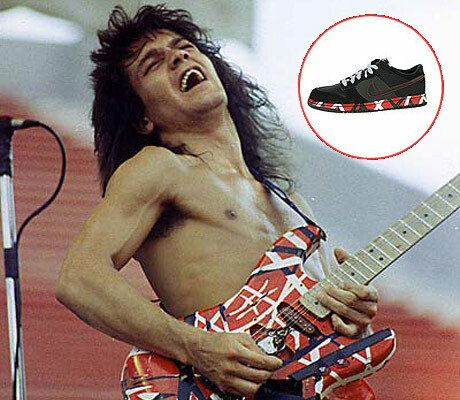 Van Halen also recently launched his own line of striped Chuck Taylor shoes under his EVH brand and asserts that Nike's use of the pattern was done without "consent, approval or license, doing irreparable harm and damage" to his signature design. He is seeking general and punitive damages, all profits arising from the sales of the brand and a permanent injunction halting production of the Nike shoes. A Nike spokesperson has dismissed Van Halen's lawsuit as "without merit."